"Sampath Speaking" - the thoughts of an Insurer from Thiruvallikkeni: school admission ~ trauma of parents waiting !! school admission ~ trauma of parents waiting !! More than 130 parents at a primary school queued from 3am in a bid to secure their child a place at a breakfast club in the new school term reads an article in MailOnline .. ..
how were you admitted in to school and as a parent what is your experience attending an interview for admission of your child ?? ~ 130 is no great number – we get more applicants for our free tuition centre – SYMA Growth .. .. in mid 1970s, my parents had some difficulty in enrolling my elder sister in to 3rd standard of N. Samarao School at Singarachari St. .. .. an innocuous statement by the school authorities, that enrolling in 1st Standard (no L.Kg / U.Kg at that time) – made by parents put me into school – even they had not planned and had taken simply because there was none to take care ! ~ and thus began my education career .. ..
Cardiff, is the capital and largest city in Wales and the tenth largest city in the United Kingdom. Cardiff is a significant tourist centre and the most popular visitor destination in Wales; in June 2013, in ICC trophy ODI, India made 331 / 7 aided by a century of Shikhar Dhawan and 65 by Rohit – South Africa were defeated b6 26 runs. Indians fielded well and Dhoni squeezed the lift out of SA chase with his shrewd employment of spinners – Ravi Ashwin, Ravi Jadeja and Suresh Raina. ‘Abhyium & Nanum’ movie was interesting – it revolved around Raghuraman and his home in Ooty. The way he narrates the story of his daughter Abhi's enrollment in school and his endless preparations for the 'parents' interview, not to mention his wife Anu's own treatment, was hilarious. A couple of years back, The Hindu had an article on a techie taking half a day’s leave from work to collect the LKG admission form for his 4-year-old daughter from a famous Chennai convent. He realised he had arrived late – he was there at 6 a.m. — only to find out that many other parents, also seeking LKG admission for their children, had parked themselves at the school much earlier. To avoid the rush, the school had put up notices outside asking parents to not wait as plenty of forms available, but this did not help. While some came in the morning, a large number had begun queuing up since the previous night. This year for the 30 odd seats in each section of SYMA tuition centre, we issued around 70 applications for Commerce group alone i.e., ensured issuance of application for all those who stood in the queue at the appointed hour – then in due process, we selected our students – we had set our eyes on random no. generation even !!! The story reported in MailOnline is about Ysgol Y Berllan Deg in Cardiff, Wales, that opens up applications for its before-school breakfast club, which has had a capacity as low as 80 pupils in the past. When it opened, parents were pictured lining the road outside the school on fold-out chairs with flasks of tea to hand as they hoped to bag a slot for each of their children. But with only 135 places available, some of the 130 parents, some with more than one child, faced disappointment, with a potential nightmare to come when the new term begins in September. The breakfast club is a government scheme aimed at providing primary school children with the opportunity of receiving a free, healthy breakfast at school each day. For many parents with a long commute it is vital as it allows them to drop their kids off early and get to work on time. 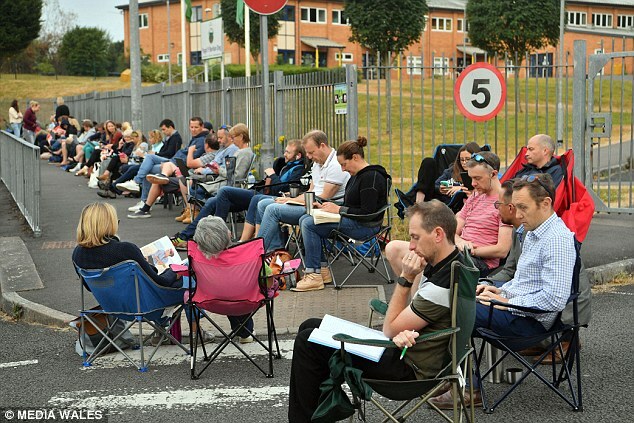 The school opened its applications for the next school year today and some parents were so worried about missing out they queued through the night outside the school gates. Front of the queue was Annett Farrow from Carmarthen, whose grandchild goes to the school. 'We have been on the road since 1am and got here at 3am,' she said. 'My son and daughter-in-law are on holiday so we had to come. If it gets them a place it will have been worth it. Another said - 'We have bought biscuits and crisps - the only problem is the toilets. We have been using the toilets in the hotel opposite!' For some parents like Leanne Taylor, who has been in her chair since 3.30am, there is no back-up plan. She said: 'I have two children, one of whom is starting in reception in September. 'I had to do this last year when it did rained a bit. I had only moved into my house two days before and I didn’t have internet. 'I planned to bring my laptop and do some work while I waited. The police turned up and asked what I was doing!' According to Leanne there is no other option for her if she wants to maintain her career. She said: 'For some it is essential. I work opposite Tredegar House and I drive in. If I drop them off at 8.30 I won’t be getting into work until 10 because of the traffic. 'If I didn’t have this I would not be able to go to work- I can’t risk not getting a place, I don’t have a plan B. 'The ones that are here first are the ones that need it most. It gets longer and earlier because the people who did not get a place last year will get here earlier this year.' Another parent, who did not want to be named, said that in previous years it had been slightly different. 'It is a big talking point among parents,' she said. 'You get a text two weeks before and then a letter. It goes straight in the diary. I have been doing this for two years and this is the biggest queue I have seen. 'I don’t know how a single parent would be able to do it as they would have to bring their children with them. 'In previous years people have bought multiple forms for friends and that has been banned because it wasn’t fair on the people who queued up. The atmosphere is much nicer this year.' Some parents are now veterans of the process. In spring this year, Prime Minister Theresa May unleashed £26million to support school breakfast clubs. The cash was taken from a sugar tax on soft drinks and spread across 1,770 state schools in England, boosting a way for parents to take care of their children while still getting to work early. The levy worked out at 24p per litre on soft drinks which contain more than 8g of sugar per 100ml. Over the border in Wales, the devolved Welsh Assembly has aimed to offer all primary pupils the chance of receiving free breakfasts each day since 2013. The move was intended to boost health and classroom concentration as well as tackle health inequality. Sections 88 – 90 of the School Standards & Organisation Act 2013 state: 'Local authorities must provide free breakfast to all pupils in maintained primary schools that have requested them'. Places changes, sometimes scenes do not ! as seeds fall by the side at Wimbledon ! Deer law ~ all are equal before law !!! the intent gaze ~ quiet eye - makes champions ! !